How Do I Decide Which Home Stager to Hire? 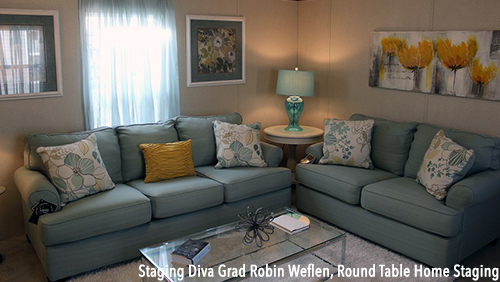 Staging Diva® Debra Gould during a Home Staging Consultation as seen on a TV News Magazine Show. Before you a hire a home stager to come to your home for a Home Staging Consultation, you should review their portfolio online and interview them in a phone call. Do I feel comfortable speaking with this person? Does this person seem to understand my needs? Does the home stager sound confident and interested in my project? As with any service business, make sure you feel comfortable with the home stager you decide to hire. How Much is a Home Staging Consultation? Avoid any temptation to base your choice to hire a home stager on pricing alone. As with most things in life, you get what you pay for. A cheaper home stager may cost you more in the long run. They may not work as quickly, or their recommendations and creative ideas are not as good. Wasted space of this hallway/landing is transformed into a functional area. A real professional will not do free home staging consultations. Be suspicious of anyone willing to come to your home and give you a “free estimate”. Such an appointment will likely waste both your time and theirs. Home stagers should be charging for their time and their expertise; if they aren’t you should question the quality of the information you’ll receive. A home staging consultation might be anywhere from 90 minutes to more than 5 hours. And prices can range from $200 to $1000 or more. The average price of real estate in your area. How they structure their services. Whether you’ll receive detailed advice during the home staging consultation. Whether the home stager will implement any recommendations during the consultation. Your square footage inside, plus how much property there is outside to discuss. The current condition of your home and everything in it. In your initial conversation, a good home stager will ask you a number of questions to make it easier for them to explain their services in relation to your situation. You should have a good understanding of what to expect from the home staging consultation before booking a paid appointment with them. 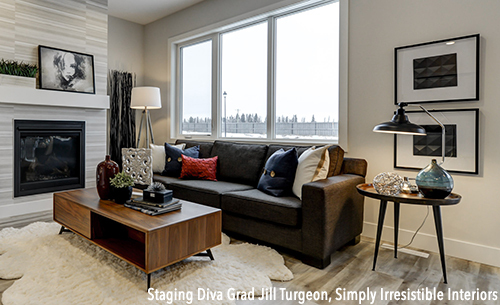 Make sure you have a clear understanding of the Staging Diva® Graduate Home Stager’s rates and payment policies when booking your home staging consultation. Most professional home stagers will expect to be paid at the end of your appointment, plus take deposits for future work. Should I Spend Money Fixing a House I’m Selling? Before: A dated kitchen will scare off buyers or attract a lower offer when they subtract the estimated cost of a total renovation. After: An amazing transformation. Notice it’s the same cabinets, floor and appliances! Can you afford NOT to invest in selling quickly and for top dollar? You have to consider both the monetary and emotional costs of not selling quickly. Living in a home while it’s on the real estate market is no picnic! You’ll have to keep it perfectly clean and tidy at all times (just in case there’s a last minute showing), you may have to send your pets out to a boarding facility, you don’t know when it will sell or for how much (which could be holding up other plans), there’s the continued carrying costs, etc. Depending on what time of year you list your property and how long it takes to sell your unstaged home, you might miss the prime real estate season entirely. Meaning that by the time you take the inevitable price reductions that your real estate agent will request when your unsold home has been sitting too long, there won’t be as many buyers around to look at it. For example, imagine if you listed your home right after Labor Day and it didn’t sell before Thanksgiving and Christmas. You’d likely be stuck with it until February or March when you’d put it back on the market. What if overall real estate prices have fallen by then? Similarly, what if you list your home on the real estate market in March and it doesn’t sell before most people leave town for summer holidays? Do you keep it on the market for 6 months waiting for the market to heat up again? Now imagine what happens when your beautifully staged home hits the market. Before: No one looking at this vacant house online would be tempted to book a showing. After: This living room is much bigger than it looked when empty. And with 90% of home buyers searching online before ever calling an agent to see a property, your listing jumps out at them because all the photos look great. Now, imagine the potential financial return of decorating your home so that multiple buyers get into a bidding war over it! While there are no guarantees, staged homes do sell more quickly and for higher prices. > You can read a bunch of case studies proving home staging works here. If you don’t believe a staged home sells quicker and for more money, spend a weekend going to open houses. Notice how drawn you are to the homes that show beautifully and how uninterested you are in the ones that don’t. Also pay attention to the comments and the discussion of potential buyers as they tour the home. What Happens in a Home Staging Consultation? 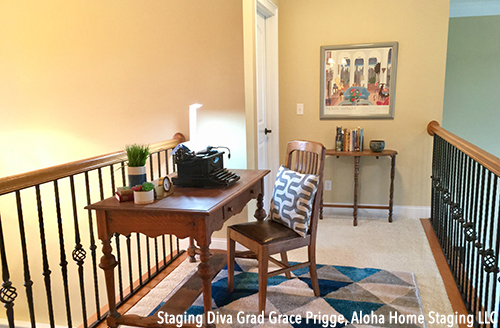 Staging Diva Graduate Home Stagers are objective about your rooms— evaluating with the eye of a highly critical buyer and finding solutions with the eye of an experienced home stager! 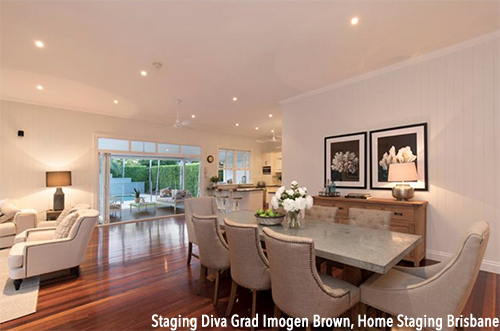 If the home stager has taken the Staging Diva Home Staging Business Training Program, she or he will begin with a general walk through your home to get an overview of the style of your house and the contents. 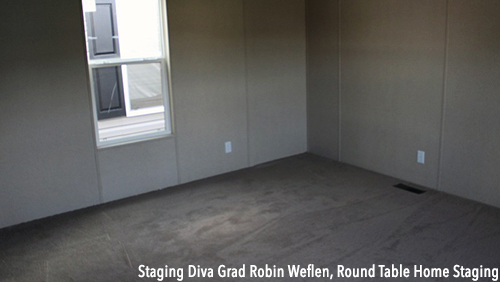 Staging Diva Graduate Home Stagers will pay close attention to the flow between rooms, how many rooms you have, and what the likely target market is for your home. She or he will also evaluate whether the current use of each room is optimal when decorating to sell. After the initial walk-through, you can expect the stager to go back to each room and then give you a detailed vision and plan for what needs to be done to turn your house into a show home. Remember that none of this advice is personal. The time has come to turn your home into a product that the maximum number of potential buyers will fall in love with. Rental furniture and accessories show buyers the potential of this simple living room in a vacant home. 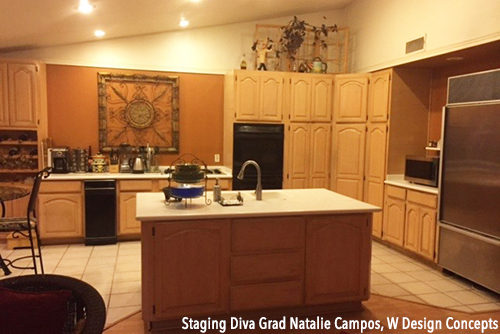 Staging Diva Graduate Home Stagers look in closets and built-in cabinets (because home buyers do this too). They’ll also give you strategies to cope with the clutter of daily life if you’ll be living in your home while it’s on the market. The stager may recommend items to be removed, suggest new furniture placement or paint colors, rearrange art and accessories, or take measurements for rental items. Depending on the stager’s experience, the size of your home and it’s current state, this process will take from 90 minutes to five hours or more. At the end of the home staging consultation, some of your rooms may be already transformed, others may have a ‘to do’ list. 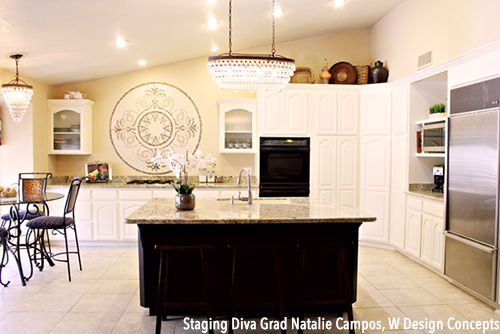 It is completely up to you how many of the items in the plan you want the Staging Diva Graduate Home Stager to handle for you, or how much you would like to do yourself. The bottom line is that when you hire a home stager for a home staging consultation (with an investment of only a few hours and under a thousand dollars), you’ll have a complete plan of what needs to be done to turn your property into a show home. Plus, much of the work may already be done for you. You could even decide to do the rest of the work yourself, following the home stager’s detailed recommendations. Remember, your home staging investment will be less than your first price reduction if your house doesn’t sell. And, you’ll be setting the stage for potentially selling within days at above asking price. > Learn more about why home staging works. Do You Have the Eye of a Home Stager? Take this quiz to see how your staging instincts compare to an established stager! 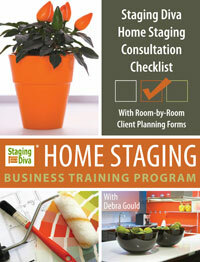 Plus get the FREE monthly "Staging Diva Dispatch" with staging tips and jobs!